To learn a little more about the in-demand programming languages (and to grab an awesomely free quick-start guide to becoming a web developer), head on over to Coding Dojo. I knew you’d say that As you might have guessed, there are a lot of places you can learn to code. Some are free and some are paid for. Before you jump in and spend a ton of money on one programming course after the next, I suggest checking out the freebie options first. If you feel you want to invest in a paid-for program down the line, go for it! At that point, you’ll know you’re in it for the long haul. But trust me when I say, these free options are so darn good, you may not even want to consider anything else. Learn to Code — for Free! At Codecademy, you can learn everything from HTML to Ruby on Rails. The Codecademy Course Catalog is brimming with lessons that will prepare you to tackle a number of projects. You’ll even learn to build your own website and publish it to the Internet. Each lesson is interactive and engaging. And for good reason — Codecademy is on a mission to change the way we learn. When you start taking their courses, you’ll take notice of their efforts and see just how fun it can be to learn to code. Codecademy is my top pick if you want to learn to code for free. This platform is perfect for budding programmers who want a step by step guide to help them reach their goals. Codecademy will even track your progress for you and create a tailormade learning path to help you reach your goals. And if you’re ever feeling less than motivated to move on to the next lesson, you can read super inspiring Codecademy success stories to help put a little pep back into your programming step. Udemy is a platform that course creators use to share their knowledge with others. Many courses are a mix of video, slides, and even quizzes! There are both paid and free courses available, and there are new ones being added all the time. When searching for “learn to code” make sure you have the “free” box checked to see a current list of freebie courses! You can see there are ten times as many paid options as free ones. 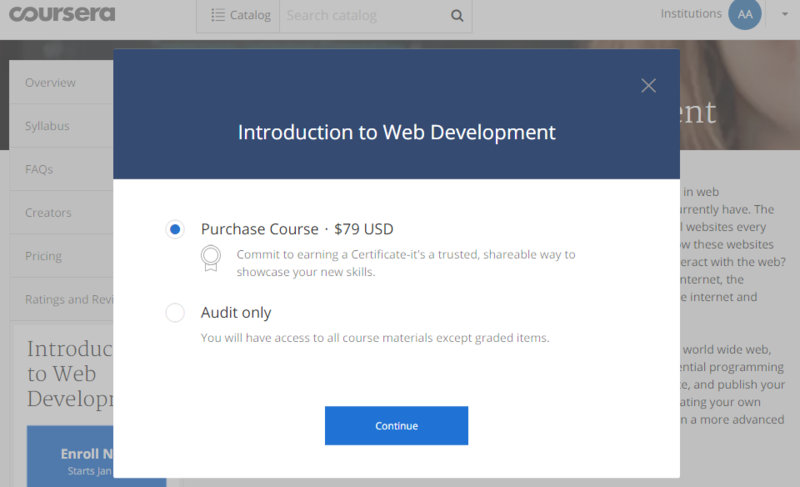 If there’s one you love that isn’t free, like the highly-rated Complete Web Developer course, don’t worry. Courses on Udemy are often very affordable — costing less than $50 on average. Keep in mind, a course is only as good as its creator. So, you may stumble upon some not-so-stellar options. Make sure to check the reviews from other students before enrolling! Coursera is a collection of courses from top universities. I’m talking Duke University, Stanford, and University of Pennsylvania! Impressive, right? You can search their catalog of courses for ones that pique your interest or try your hand at some of their popular offerings in the Computer Science category. If you enjoy learning in a traditional classroom environment, you may want to learn to code with Coursera. Before you ‘enroll’ in a course, you’ll learn upfront what the prerequisites are, the weekly time commitment, and receive a syllabus of projects and lessons. Remember, courses are taught by actual professors at top universities, so you’ll have to participate and finish assignments by certain dates. Not all courses are free at Coursera. And even the free ones have a premium option. With the premium option, you’ll receive a certificate upon completion. You’ll also get graded assignments — two important features not available in the freebie option. If your end goal is to work as a developer, seriously consider purchasing courses. The certificate will be recognized by prospective clients and employers and will make a nice addition to your resume! But, don’t worry, if you have your heart set on a program that requires a purchase but can’t afford it, there are financial aid options available. Once you do, you’ll get to work on projects for nonprofits! This is a great way to give back all while building your portfolio. Free Code Camp’s ultimate goal is to help you launch your flexible career as a developer. And having a portfolio filled with non-profit projects to show off will certainly help you do just that. To date, more than 2,000 people, like you, now have developer jobs thanks to Free Code Camp! The best way to learn to code is to jump in and get your hands dirty! Even knowing basic HTML and CSS can set you a part from your peers. True Story: A client paid me double for web content I wrote because I included very basic formatting. Questions? Confused? Sound off in the comments below. I’m happy to help! This post contains affiliate links. I only recommend products, services and businesses I know and trust. Learn more about my use of affiliate links by checking out this disclosure statment. 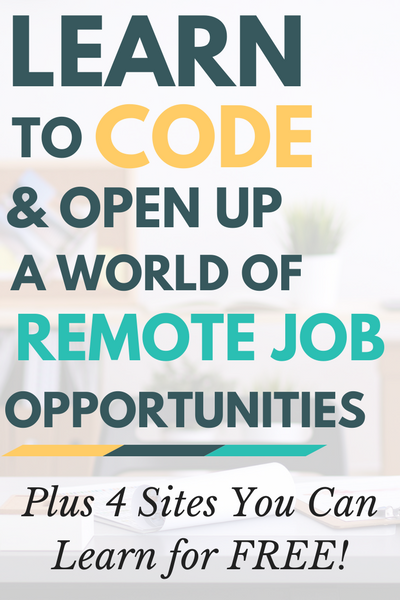 The post Learn to Code — and Open Up a World of Remote Work Opportunities appeared first on Work from Home Happiness.